Freedom Debt Relief was founded in 2002 in San Mateo, California by graduates of Stanford’s School of Business. The company offers customers plans that help them settle their debts once and for all, out of both San Mateo and Phoenix, Arizona. Customers receive a financial consultation that inspects all of their debt and credit issues. Then the company acts as an advocate, contacting each creditor and setting up payments that are merged into a simple consolidated payment. Through their customized plans, over 250,000 customers have been able to get their financial lives back on track. They also offer basic credit counseling services for those who don’t need a total consolidation plan. When considering debt consolidation services, the main points that most consumers look at are the company’s ability to reduce debt, and the fees they charge to do so. For most debt consolidation services, the fees that are incurred reduce the actual savings so much that they are hardly worthwhile. Freedom Debt Relief does have a solid track record for reducing debt roughly 50% for most of their clients. Their fees are based on the amount of debt you enroll in their services, around 18% to 25%. So this means that you’ll see a total debt reduction of between 25% and 32%. This is a higher overall debt reduction than many other consolidation services out there. However, other companies only take a fee based on the total settled amount, rather than the total amount of debt you had to start with. Freedom Debt Relief claims that the average time it takes for their representatives to establish a debt relief program is two to four years. While this seems like quite a long time at first glance, remember that you don’t have to pay any fees or upfront costs until your debt settlements are arranged and you begin making payments on the consolidation. You can even get a free quote to see if you qualify (you must have at least $7,500 of debt that needs to be settled). One of the downsides of such a long process is that debts could go to collections or a court case before the settlement is ever started. The company does have a history of helping create and lobby for federal regulations that help protect consumers in debt. They helped establish the federal requirements for licensing in the debt consolidation industry. During this time, they also settled several lawsuits in which some states and individuals claimed that Freedom Debt Relief was not settling debt correctly. In each of these lawsuits, Freedom Debt Relief was found to be innocent of the charges, and settled outside of court. Freedom Debt Relief's lower fees and great reputation as representatives of consumers communicate that they’re on your side, and want to help you succeed. Freedom Debt Relief is one of the most well-known consolidation services for a reason. Their lower fees and great reputation as representatives of consumers communicate that they’re on your side, and want to help you succeed. Even with only a relatively short amount of time in the industry (fourteen years), they’ve helped settle over three billion dollars in consumer debt. With the free consultation service, there’s really no reason not to talk to a representative if you have more than $7,500 that needs to be settled. Have you had an experience with this company? 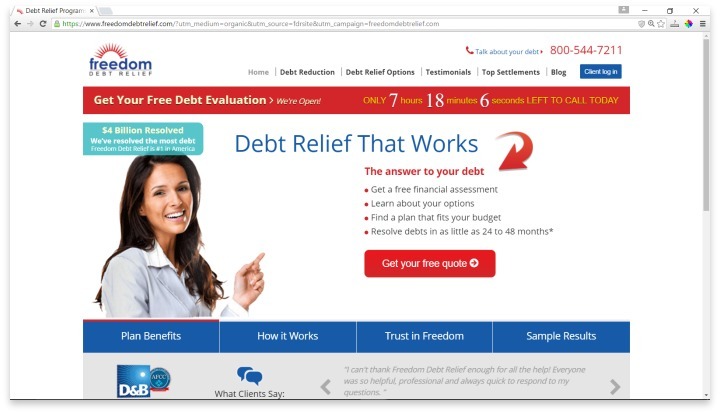 Please share your Freedom Debt Relief reviews below.